PORT HARCOURT AND NON-FUNCTIONAL STREET LIGHTS: HOW DID WE GET HERE? Port Harcourt, the Rivers State capital is unique in its own way. Apart from being the hub of oil and gas in sub-Saharan Africa, the 'Garden City', as it is known boasts certain facilities which other major cities in Nigeria seem to be in want of. One of such facilities is the street light, mounted in every major street within and outside the city and its environs. Such major streets include Harold Wilson Drive, Churchill Road, Airport Road, Olu-Obasanjo Bye-Pass, Ikwerre Road, Aba Road and Aggrey Road. Other streets that are beneficiaries of these street lights are Stadium Road, Government House Drive, Forces Avenue, Rumuola Road and several others. In 1988, Aggrey Road, which could be best described as the 'centre' of Old Port Harcourt Township, was rated as the 'most beautiful street in Nigeria' by the United States-based Cable News Network (CNN). It is believed that a street in Port Harcourt would not have been rated as such if not for the presence of functional street lights the illuminate the streets from both sides at night. Residents of Port Harcourt continued to enjoy the illumination brought by these street lights until May 1999 when military rule gave way for civilian rule. It is noteworthy that it was the military administrations that were in the state at various times that installed and maintained most of the street lights in Port Harcourt. With the coming into power of Dr. Peter Odili-led civilian government in 1999, residents were of high hope that they streets of Port Harcourt would continue to be illuminated as the new civilian administration looked ready to continue from where the military stopped as regards maintenance of the street lights. The Odili-led government further raised the hope of residents when it decided to replace the old street lights with those that are powered by solar energy. Note minding the huge sum of money budgeted for the project by the state government, the people of the state, especially residents of Port Harcourt never raised eye-brows over the amount, because, even, toddlers knew saw the project as a laudable one. 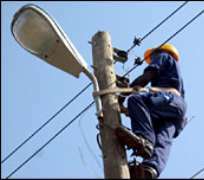 All the street lights in Port Harcourt and environs were made non-functional by agents of the State Ministry of Power, in order to make way for the solar-powered street lights. Unconfirmed sources even said that the underground cables connecting the street lights were removed by unknown persons, who always come at ungodly hours of the night to dig out these cables. Judging by the time these unknown agents come to carry out the job, residents of Port Harcourt got convinced that most of them were on illegal duty. The Odili-led government succeeded in removing the old street lights and replaced them with those powered by solar energy, but as it is now, those solar-powered street light are not functioning. For instance, in Aggrey Road, there are over 500 solar-powered street lights that adorn both sides of the ever-busy road, from the beginning to the end, yet, only one of them is functional today. The story is not quiet different from other streets and major roads in the state capital where such solar-powered street lights could be found. One is forced to ask if the Odili-led government did not make provisions for those who will maintain the street light before spending questionable huge amount of tax payers' money to install these facilities. Even residents of the city thought that the solar-powered street light installed on the Government Residential Areas were of superior quality when compared to those in the streets and roads but unfortunately, all of them packed up at the same time. The present administration in the state led by Governor Chibuike Rotimi Amaechi should, as a matter of urgency call the contractors who handled the project to come and clean up the mess they created in the of solar-powered street lights in Port Harcourt. These moribund solar-powered street lights are depicting the austenitic of the Garden City. Let them be worked upon or possibly, removed and replaced with our dear old NEPA- powered street lights, please.